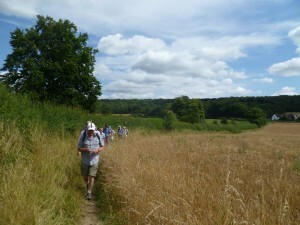 The big day out in the Chilterns this Summer was a great success for all who came along. Warm, sunny weather provided excellent conditions for the event, which included the options of a long walk or a short one, followed by a braai/barbeque. Several of our Trustees and a handful of UKZN UK Trust supporters were made welcome by the organisers, Steve and Tonia Bowley, whose Thembisa Trust backs community projects in KwaZulu-Natal and elsewhere. We were delighted to have had the opportunity to mingle with the Thembisa Trust’s supporters and to have enjoyed Steve and Tonia’s hospitality. A couple of dozen people took part in the long walk, led by Steve. Starting near Wendover, Bucks, the ramblers stopped at the Boer War memorial on Coombe Hill, with wonderful views across the countryside to the North and West. Passing through shady woods, they emerged near the Prime Minister’s official country residence at Chequers, before going on to lunch in the garden of The Plough at Cadsden (the pub where David Cameron’s daughter once was left behind accidentally by her parents). 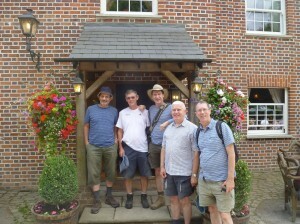 The other group enjoyed a shorter walk past lakes near Steve and Tonia’s home at Tiddington, Oxfordshire. Everyone then gathered in the garden of their home for food and refreshments. A presentation was made on the work of the Thembisa Trust, providing help to some desperately poor communities. The charity’s patron, the actress Dame Janet Suzman, made a short speech praising its work. Some money was raised for the Thembisa Trust but the UKZN UK Trust also benefited from donations which came in from well-wishers who sponsored members of our group on the walks. We are very grateful to Steve and Tonia for inviting us to join them on what was a very good, very sociable and enjoyable day. Please see www.thembisatrust.org for more information on their charity. If you wish to express your backing for those supporters of the UKZN UK Trust who did sponsored walks, please make a donation.